This article from Sean Jensen was originally featured in the Winter 2010 edition of Sports Spectrum Magazine. New Orleans Saints Super Bowl MVP quarterback Drew Brees doesn’t possess the speed of a Michael Vick, the prototype frame of a Peyton Manning, or the arm strength of a Jay Cutler. Therein lies what makes Brees special. He doesn’t have the ideal size (6 foot), arm strength or pedigree (second-round pick out of Purdue). But he has thrived at each level. He led Westlake High School (Austin, Texas) to its only undefeated season (16-0) and a state title in 1996, when his team won the 5A Division II championship with a 55-15 victory against Abilene Cooper. He also led Purdue to the 2001 Rose Bowl, the school’s first appearance in the prestigious bowl since 1967, and a surprising upset of then No. 4 Kansas State in the 1998 Alamo Bowl with a brilliant 80-yard scoring drive with 1 minute, 25 seconds left in the game. Saints coach Sean Payton also notes that Drew isn’t the prototype quarterback, in terms of size. But Payton says he has the prototypical leadership qualities, preparation and intangibles that demand respect. 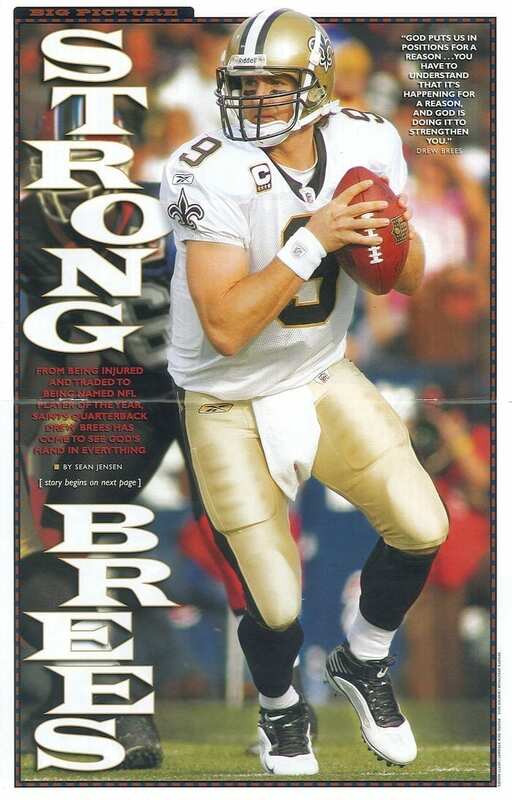 In 2008, Brees raised that bar and established himself as one of the league’s top quarterbacks. He passed for 34 touchdowns and 5,069 yards, the second-most yards in NFL history and only 15 yards short of Hall of Fame quarterback Dan Marino’s NFL record for a single season. Remarkably, Brees threw for more than 300 passing yards 10 times last season, earning Associated Press Offensive Player of the Year and being named to his third Pro Bowl after also being named in 2004 and 2006. He says he wasn’t aware of how close he was to Marino’s record or even 5,000 yards. 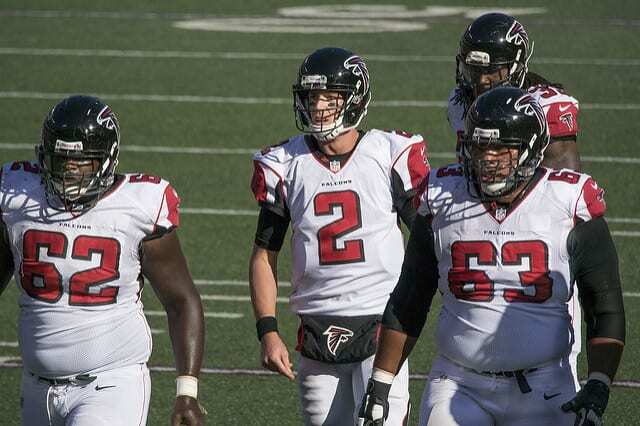 But his teammates, particularly his offensive linemen, wanted him to break the mark. Though he followed that season with a few less yards, he gladly traded it for a Super Bowl ring and gave the city of New Orleans its first title in any of the major sports. He earned Super Bowl MVP and led the Saints to a 31-17 victory against the Indianapolis Colts in the game. Drew and his younger brother Reid grew up in church, learning the songs and stories of the Bible. But the real draw was their countless friends in Sunday school. Everything didn’t click for Drew, though, until his 17th birthday. He was at his home church, The First Baptist Church in Austin, Texas, and his pastor had a message that registered in his mind. The pastor’s message: the Lord was looking for a few good men. He even referenced the popular 1992 movie, A Few Good Men, which was one of Drew’s favorite movies. While at Purdue, though, Drew acknowledged that he was “more out of touch” than he wanted to be. Sometimes, he slept in Sunday morning after a late night with friends. “It’s not like I abandoned it. But you go through that lapse,” he said. But after the Chargers drafted him in 2001, Drew joined the team’s Bible study, which was led by Pastor Shawn Mitchell. Now entering his 27th season as the team’s chaplain, Mitchell says he has been blessed to work with many good men associated with the Chargers. But Mitchell describes Drew as a “standout” and the “real deal,” citing his humbleness, his leadership, his compassion and his spiritual maturity in the face of adversity. 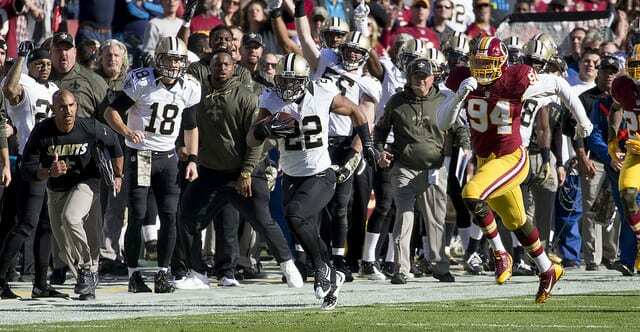 Brees endeared himself to his teammates, Mitchell says, with his perseverance. Players were split on Brees and veteran Doug Flutie during the 2003 season, when the quarterbacks each led the team to a measly two victories apiece. The next offseason, after the selection of North Carolina State quarterback Phillip Rivers in the NFL draft, Brees tearfully and prayerfully asked God for strength, Mitchell said, during training camp. “We kicked off that year in prayer, then God began to raise up Drew, to the athlete that we see in New Orleans,” Mitchell says. 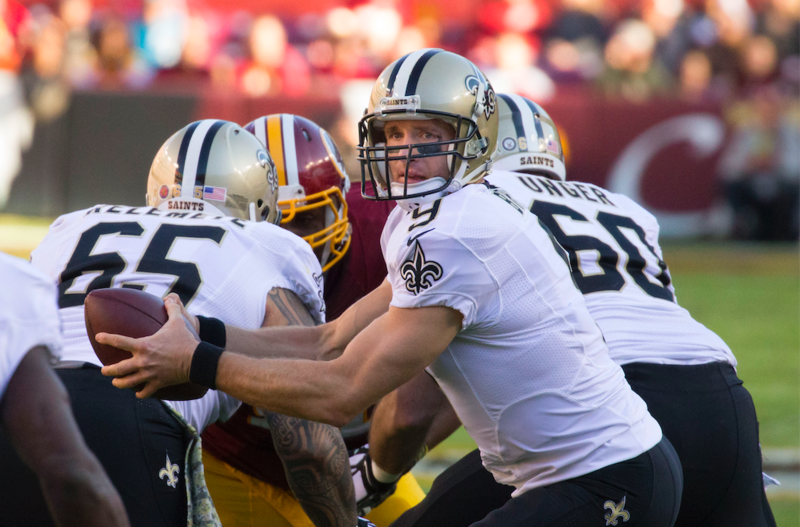 Brees weathered several storms before arriving in New Orleans. The first followed a 4-12 season in 2003, when Brees battled for the starting spot with Flutie. After the season, the San Diego Chargers traded their No. 1 pick in the NFL Draft to the New York Giants for multiple picks then selected Rivers fourth overall. Still, because of a protracted holdout by Rivers, Brees started the 2004 NFL season, and he resurrected his career (NFL Comeback Player of the Year) and his team (AFC West champions, with a 12-4 record). Through the ups and downs, Brees maintained his faith. But he endured another storm at the end of the 2005 season. Although the Chargers had been eliminated from the playoffs the previous week, the club wanted to win their 10th game of the season against their AFC rival Denver Broncos at Qualcomm Stadium. Attempting to recover a fumble, Brees absorbed a questionable hit (while on the ground) by Broncos defensive tackle Gerard Warren that tore his labrum and partially tore his rotator cuff. An inevitable question eventually permeated into his mind, if only for a moment. A second-round pick of the Chargers in 2001, Brees had established himself as a leader on and off the field, and he helped turn around the fortunes of the franchise. He and his wife Brittany loved the community, and he even admitted to a San Diego radio station that he was willing to take less than “franchise-type” money to remain with the Chargers. “I absolutely wanted to stay,” Brees said. “I was part of rebuilding that team and getting them going in the right direction. So he was devastated when Chargers general manager A.J. Smith made clear to him and his agent Tom Condon that the club wasn’t convinced of his recovery, with a modest contract offer that included an even more modest guaranteed bonus. 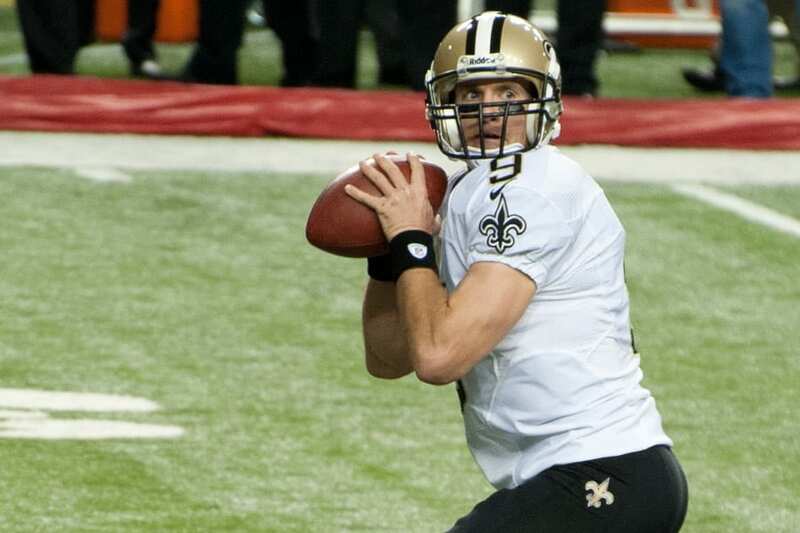 “I said, ‘This is the worst thing that has happened to me in my life,’” Brees recalled. Yet Brees, considered a “franchise-type” quarterback by two other clubs, opted to play for the New Orleans Saints and immediately steered them to the NFC South title and the NFC Championship game. Brees doesn’t like to gloat about his statistics. But there is one thing he’s proud to brag about: the Drew Brees Foundation. In San Diego, his foundation focused on children with cancer. But, upon arriving in New Orleans in 2006, Brees broadened the reach of his foundation to help rebuilding efforts after Hurricane Katrina devastated that region in August of 2005. After the 2006 season, Drew was named the Saints’ Walter Payton Man of the Year. “We completed a $1.8 million fundraising campaign,” Brees excitedly said. “In the last seven years, we’ve raised or committed $4.5 million. He is even more proud of his son, Baylen, who was born on a special day, January 15. That is Drew’s birthday, and Brittany naturally delivered Baylen in about an hour, in the mid-afternoon. In fact, Baylen’s birth bolstered Drew’s faith. Child No. 2 was born in the 2010 season. Life couldn’t be better for Drew Brees, as he prepares for his fourth season with the Saints.